The survey was conducted upon William's instructions approximately 20 years after the invasion. The Saxon Chronicle records that it took place in 1085, whilst other sources claim 1086. In either event it forms a remarkable written record of the state of the nation so soon after the invasion. The whole exercise was conducted in less than a year and is now held in the Public Record Office. How many hides? How many ploughs, both those in lordship and the men's? How many villagers, cottagers and slaves, how many freed men and Freemen? How much woodland, meadow and pasture? How many mills and fishponds? How much has been added or taken away? What the total was and is? How much each free man or Freeman had or has? All threefold, before 1066, when king William gave it, and now; and if more can be had than at present? 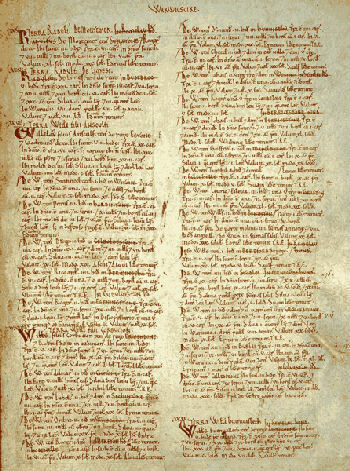 It was called the Domesday Book by the landowners because it was the final authoritative register of rightful possession in the land, by analogy its judgement was as final as that of Domesday. Each manor is listed with it's owner, with other details and in particular relates values of those manors before, during, and after the invasion. The Domesday survey was far more than just a physical record, it was a detailed statement of lands held by the king and his tenants and of the resources that went with those lands. It recorded which manors rightfully belonged to which estates, thus ending years of confusion resulting from the gradual and sometimes violent dispossession of the Anglo-Saxons by their Norman conquerors. It was moreover a 'feudal' statement, giving the identities of the tenants-in-chief (landholders) who held their lands directly from the Crown, and of their tenants and under tenants. The Manor of Winsham, which was 10 hides (1200 acres), was held by the Canons of Wells Cathedral in Saxon times. It was seized briefly by Harold II but reverted back to the Canons after the conquest. Winsham was mentioned in Domesday Book as Winesham meaning 'Wyna's settlement' from the Old English wynes and ham. 50 villagers with 9 ploughs & 6 hides. 1 pigman who pays 12 pigs. 2 mills which pay 20s; meadow, 6 acres ; woodland � league long and 1� furlongs wide. 2 cobs; 15 cattle; 13 pigs; 270 sheep. Also at the time of Domesday two Barons, William de Mohun and William d'Eu, were Tenants in Chief holding lands in parts of what is now Winsham parish. Bringing many knights and men-at-arms to the Battle of Hastings, William de Mohun (Moyon) held 55 lordships in Somerset, with his seat at Dunster Castle. His grandson, William would become the first Earl of Somerset. William was from Moion near St.Lo in Normandy. Lands held by William d'Eu in Somerset included :- Chilton Cantelo, Hinton Blewett, Hinton St. George, Laverton, Tickenham, Whatley (Winsham), Yeovilton. Acre - Measurement of land used in Domesday mainly for pasture, meadowland and woodland, which varied from region to region. Carucate - Measurement of land in Danish counties, the equivalent of a hide. Used in Domesday for tax purposes. Freedman - A former slave, now of similar status to the lower class of peasant. Freeman (liber homo and sochemann) - The two Latin terms have similar meanings; a villager of higher class than a villanus, with more land and obligations; a soke man, for example, was liable to attend the court of his soke. Furlong - A quarter of a virgate, or a measure of length, originally Roman; commonly 220 yards, similar to the modern furlong used in horse racing. Hide - 120 acres, although this could vary, and sometimes was apparently around 240 acres. Domesday hide values were not real measurements of land, but figures on which tax (geld) was based. Lordship - Land held and farmed by the tenant-in-chief himself, or by the under-tenant himself (or herself). Mill - A watermill. There were no windmills in England for another 100 years. Plough - In Domesday the word implies a plough team with its eight oxen and the plough itself. The measure of a carucate was originally the amount of land which such a team could plough in one day. Slave - A man or woman who owed personal service to another, and who was un-free, and unable to move home or work or change allegiance, to buy or to sell, without permission.